Last year I took the unprecedented step of subscribing to not one, but two local community radio stations, RRR 102.7FM and PBS 106.7FM. I kind of got sucked into their subscribe-a-thons because they do such a great job with them, but I also figured I do listen to them when I’m driving around in a GoGet car, and certainly get my money’s worth. What is great about listening is the absence of whiny and insistent ads for things you neither think about nor want to buy. Public and independent radio has for a long time been my much-loved medium for information, thoughtful comment and music (my other favourites are of course ABC Classic FM and ABC Radio National). I sometimes engage deeply when I am listening to broadcasts, and I blogged about one such experience in Skirting the Doldrums. Listening to radio sends me on philosophical tangents, takes me delving into filing cabinets worth of memories and often makes me laugh or cry. In the form of independent radio, it can bring a diversity of sounds and opinions that is so sadly lacking from mainstream media. As part of Melbourne Rare Book week in 2016, I was lucky enough to take a guided tour of the hallowed conservator’s room in the State Library of Victoria where we were shown some large posters that were being prepared for the upcoming RRR exhibit to mark their 40 year anniversary, ON AIR: 40 years of 3RRR. Being newish to Melbourne, it was not until I wandered into the State Library of Victoria just before Christmas that I saw the manifestation of the strong and vibrant grassroots movement I’d joined. The space set aside in the Keith Murdoch gallery of the State Library of Victoria forms a fitting tribute to the hours of audio, hundreds of volunteers, social and musical history of Melbourne community radio. It is an interesting challenge to showcase the history of audio and musical culture in a building housing a collection devoted to books but it is successful in its multi-media approach. Ranging from letters to the station, posters and other ephemera to a collection of audio devices found in the station and prepared video interviews with station stalwarts, this display was a walk down memory lane for a child of the 1970s whose musical experience spans exactly the same era. I’m sure for music lovers who have resided in Melbourne during the last 40 years, this exhibition would re-kindle many memories. The display also speaks to the symbiotic relationship between the station and the local/national alternative music culture and industry. The value of RRR is in the alternative voice it brings to Melbourne’s cultural mix. The fact that it has lived and grown to a community of over 12,000 people in the 40 years is a testament to the need for it and it has now taken on a life of its own, “It’s there as an alternative to the mainstream. It’s a bit like a footy team – committee men (sic) come and go, players come and go, but the fans and the colours stay the same” Leaping Larry L, 2004. I would thoroughly recommend a visit. It is a free exhibition and its showing has been extended until 26th February, 2017 at the State Library of Victoria. This entry was posted in Shall we ... ? 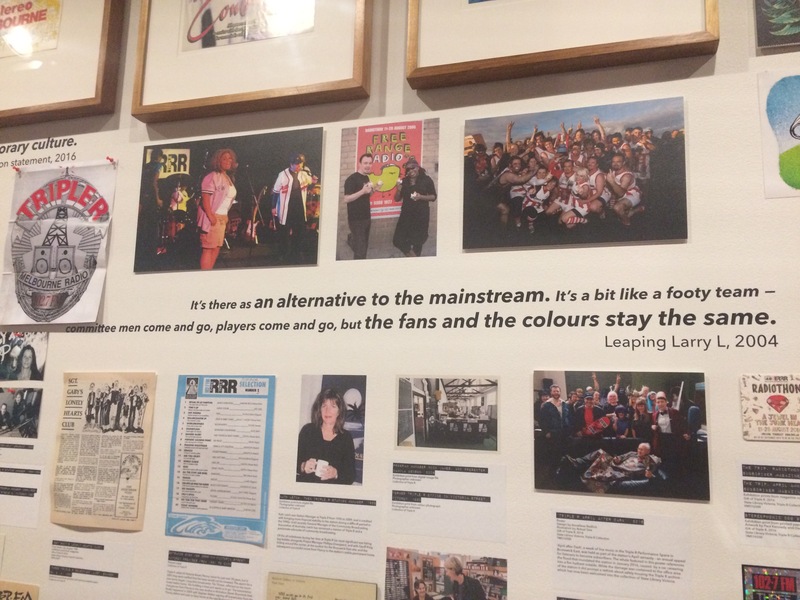 and tagged Alternative music culture, Current exhibitions at State Library of Victoria, Goget, History of independent radio in Melbourne, Melbourne Rare Book Week 2016, ON AIR: 40 years of 3RRR, PBS 106.7FM, Review of ON AIR: 40 years of 3RRR, RRR 102.7FM, Skirting the doldrums, State Library of Victoria, Things to do in Melbourne CBD, Triple R by bronwhy. Bookmark the permalink.